Go with your students on an eighteen week journey building their own company called Influencer Incorporated. 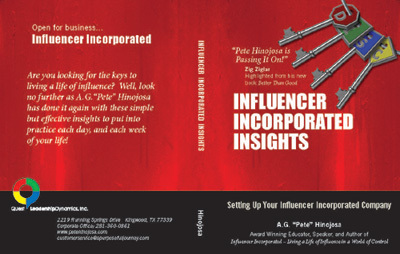 Influencer Incorporated is a metaphor that empowers students to develop positive and lasting relationships through building up their reputation and creating referrals for life. It all starts with Influence…As I tell my students you can either influence people positively or negatively the choice begins with you! Student Leadership Class is a one or two semester course for students with emphasis on personal growth. Self-awareness and implementing the “Learn, Stretch and Grow” philosophy! Building a life based on a foundation of character and integrity. Building a foundation that you can stand on and for regardless of the times. Explaining and exploring the four personalities in an interactive fun book, with a style analysis. Solving the inner workings of why you do the things you do. What is leadership? What are the myths of Leadership? Who is a leader? How does a leader develop influence? How to develop your leadership potential. (Leadership in Action) How can your attitude determine your success and potential? The anatomy of a failure or what prevents us from success before we ever start. How does your mind work (the conscious and subconscious- the human potential)? Do you have a VISION and a PURPOSE for your life (Setting a mission and direction)? Looking at the causes of a negative self-image and developing a positive self-image. Developing a DREAM for your life that you can believe in. How to recognize a positive self-image. How to turn your negative self-image around. Taking ACTION… NO more Procrastination! Exploring how our needs can cause changes in behavior. Goal-setting, goal-sweating and goal-getting. Why don’t we set goals? What are the benefits when we have a definite aim and direction? I have students within my class that are “A” students and some that struggle to get passing grades. Regardless of their academic achievements, the students find relevance and opportunities for growth through this program. Furthermore, I have received emails from parents telling me that have noticed their son or daughters self-esteem and attitudes improve since they have started the class. When I see and hear these things, it makes me very excited about the future. To be honest, as a teacher facilitating this program for the first time, I feel as though I have only scratched the surface. The potential this class offers to influence students in a positive manner can expand and grow with me in years to come!